Modernization of the Donna Ford Attallah College of Educational Studies building preserves historic neoclassical style. Irvine, Calif. – R.D. 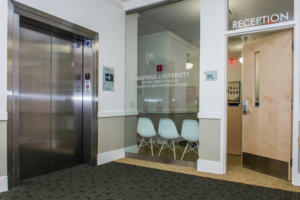 Olson Construction, an award-winning general contracting firm in California, completed the historic renovation of Reeves Hall at Chapman University. Home to the Donna Ford Attallah College of Educational Studies, it is one of the original five buildings of the former Orange Union High School that make up Chapman’s historic core surrounding Bert Williams Mall. It is located at 333 North Glassell St. in Orange. The renovation preserved the building’s historic neoclassical style while incorporating a complete seismic retrofit, new elevator that complies with the American with Disabilities Act (ADA), reengineering of the HVAC system, fire and life safety systems and a general build-out of the offices and classrooms. Interior improvements include new paint, carpet, tile and restrooms and enhanced Wi-Fi. Originally built in 1913, the 17,000-square-foot building includes two stories and a basement. Additional elements of the modernization include exposing the original red brick on the interior of the perimeter walls and restoration of existing wood features on the stairwells. The historical integrity of the building remains intact, and it is included in the National Registry for Historical Buildings. In addition to Reeves Hall, R.D. Olson Construction has completed several other projects for Chapman University, including the Hilbert Museum, Partridge Dance Center and Rinker Health Science Campus. Other higher education projects include California Polytechnic University, Pomona’s Restaurant at Kellogg Ranch and California Baptist University’s James Building. R.D. Olson Construction partnered with ADAY Architects, P2S Engineering Inc. and ABS Group on this project.